A few weeks ago on a Saturday night, my friends and I were jonesin’ for a place with great food where we could sit, relax, eat dinner, and be merry. Up until this point, I’m not quite sure how many people had looked at me in horror, and with a high-pitched voice exclaimed, “WHAT? You haven’t been to Steuben’s???!!? ?” No more of that – I have visited and endured the famous, comfort-food eatery that is Steuben’s Food Service. 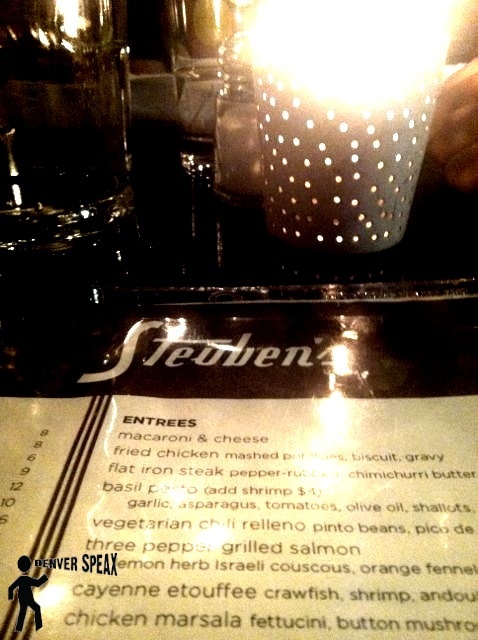 Steuben’s is situated at 523 E. 17th in Denver, on the corner of 17th and Pearl in an old auto-garage turned restaurant. The restaurant sports many areas to park (and lock up) both your bike and your car; however, with the popularity of this place I’d hands down suggest riding your bike. It can be tricky to find a spot to park on the weekend when everyone has the same idea as you to visit! What’s great about the Steuben’s experience is the fact that there’s something for everyone (kids included!). The menu is so diverse and does a great job of including new and old American comfort food favorites. Capturing regional influences, dishes are re-created from fan favorites all over the country, and provided for a moderate price here in Denver at Steuben’s. Favorites include shrimp and grits, mac n’ cheese, fried chicken, and (my extremely satisfying choice) a cayenne etouffee. For starters, we ordered up some steubie snacks – little fried pieces of meat topped with powdered sugar, paired with a delicious sauce that actually off-set the sweetness of the powdered sugar. Simply genius, fellas – simply. genius. We sat inside, and unfortunately with the lighting, the pictures I took of our food were reluctant to provide real insight into Steuben’s awesome offerings; thus, I left them out. By the way, in addition to having indoor seating and bar seating, Steuben’s also provides a great patio, perfect for the weather we’ve been experiencing here in Denver. The ambience where we sat was nice, calming, home-like, and welcoming. I could definitely sit back, relax, and enjoy some great food – just what we were hoping for! Don’t really have time to sit down and eat? No worries – they offer a take-out menu, food truck, and sell a Vesta cookbook! Not really hungry, but interested? Look up their episode on Diners, Drive Ins, and Dives and see for yourself before you try it out. Another awesome place to visit in Denver; go check it out this weekend when you have a hankering for something new. Quite sure you won’t be disappointed!